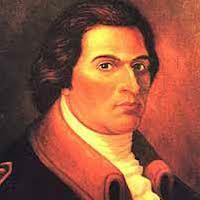 Benedict Arnold (1741-1801) was an American general who became one of the most infamous figures of the Revolutionary War. Born to an affluent Connecticut family, Arnold served with a local militia brigade during the French and Indian War before becoming a successful merchant and retailer. Like others of his calling Arnold was critical of British taxation and trade policies, some of which had adverse effects on his business interests. He returned to military service in 1775, commanding a local militia brigade that marched on Boston after the Battle of Lexington. Arnold displayed a natural capacity for leadership, a quality spotted by George Washington, who gave him important commissions; he eventually reached the rank of major general in the Continental Army. In May 1775 Arnold led a daring but successful raid on the British fort at Ticonderoga. His leadership was pivotal to American strategic advantages from the Battle of Valcour Island (October 1776) and the Battle of Saratoga a year later. But while Arnold was one of the most capable generals in the Continental Army, he was unpopular in some quarters due to his demeanour, perceptions of his arrogance and his tendency for self-interest. Arnold was plagued by debt and felt unfairly criticised. In 1779 he began secret negotiations with British agents. He eventually offered to switch sides and surrender the American fort at West Point to the British, in return for a large amount of cash and a general’s commission in the British Army. Arnold’s plot was uncovered in 1780, forcing his defection to the British. He was appointed to the rank of brigadier general and given command of a Loyalist regiment. After the Revolutionary War Arnold was forced to flee to Canada and then Britain, where he again became a merchant. In the United States, his name became synonymous with treachery and betrayal.